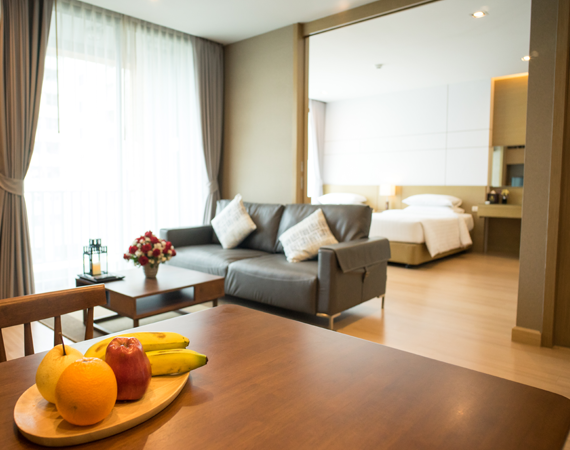 The simple luxury, spacious and serenity is the concept of our hotel to enhance the greatest stay in Chiang Mai. The hotel offers 20 Junior Suites King, 16 Junior Suites Twin and 6 Executive Suites with the modern design as private residence. 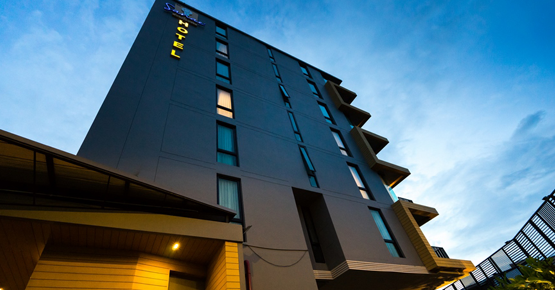 Sanae Hotel Chiang Mai is located in Soi Sukkasem Nimmanhaemin Road the best location. 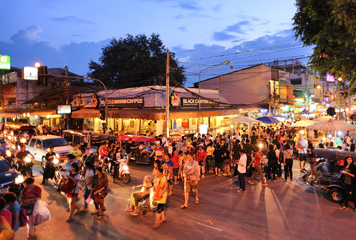 Major department stores and shopping areas together with famous restaurants are within walking distance. No matter how vibrant Nimmanhaemin Road is, once you in our hotel you could feel the graceful view of Doi Suthep, the relaxing of the hotel atmosphere, the gentle and up-close services that rejuvenating your body and soul. 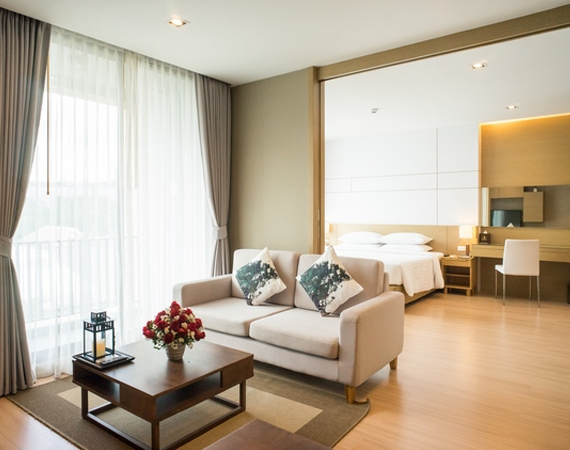 The simple luxury, spacious and serenity is the concept of our hotel to enhance the greatest stay in Chiang Mai. The cozy atmosphere of Twin Suite Room helps refreshing from your busy day. Perfect for the business traveler who requiring multiple stay. Specious with stylish and peaceful living space , high ceillings sepearate bathtub and shower. Each room comprised of working area. washing machine and well-equipped pantry. This is top suites of our hotel. The interior is designed meticulously to give the full comfort. Be one of our list of distinguish guests. Beat the heat, relax your body and soul by the pool. Our pool located in the garden designed to make you feel privacy and cozy from 7.00 am. to 8.00 pm. The restaurant is facing the public alley, serving All Day Breakfast and A la Cart from 7.00 am. to 3.00 pm. From 6.00 pm. to 11.00 pm. serving variety wine, beer and snack. Enjoy demi al fresco ambience no matter day or night at our Saded Cafe' & Bar. Located at the back of the hotel. This green area is best to unwind your busy day. The greenery it finely selected to imitate the beauty of nature. 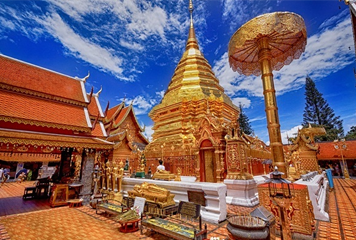 Doi suthep is the iconic mountain of Chiangmai situated Wat Phra That Doi Suthep(Temple) and Pu Ping Palace. The place that everybody must go. 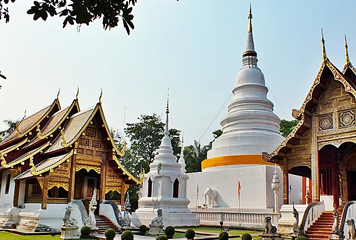 The magnificent Lanna architecture style worth visiting among other temples . the temple and chedi is beautiful and must for photographers.